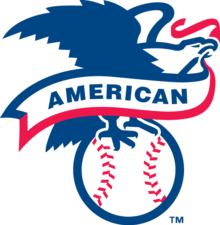 The logo for the American League. The History of the American League, officially known as the American League of Professional Baseball Clubs and often abbreviated AL, stretched back into the late-19th century. Prior to 2000, when the AL and NL were dissolved as separate entities and merged into the organization called Major League Baseball, the American League was one of the two leagues that made up major league baseball. Originally a minor league known as the Western League, the league later developed into a major league after the American Association disbanded. In its early history, the Western League struggled until 1894, when Ban Johnson became the president of the league. Johnson led the Western League into major league status and soon became the president of the newly renamed American League. The American League has one notable difference over the National League, and that is the designated hitter rule. Under the rule, a team may use a batter in their lineup who is not in the field defensively, compared to the old rule that made it mandatory for the pitcher to hit. The earliest predecessor to the American League was the Northwestern League, a minor league with teams based in the Midwestern United States. Along with the National League and American Association, the Northwest League was one of the three leagues that signed the National Agreement, an agreement wherein the signers covenanted to honor contractual agreements between players and teams and set a minimum salary for players. The league soon became known as the Western League, and went through financial woes, including disbanding multiple times. Along with Ban Johnson, Charles Comiskey purchased the Western League in 1892. Ban Johnson was the president of the Western League and was the eventual president of the American League. Johnson hoped to clean up the sport of baseball by purchasing the league, including allowing umpires to suspend players who used profanity and disputed calls. Johnson hoped to use his league as an example of a well-run league that was organized, profitable, entertaining and appealing. In Johnson's first season at the helm of the Western League, 1894, most of the leagues' franchises turned a profit and by 1895 attendance began to climb for teams around the league. In 1896, Johnson brought Connie Mack in as a manager of the Milwaukee, Wisconsin team and he became a major piece in what would soon be the American League. The first signs that the Western League could become a major league appeared when the league began to attract many high caliber players and managers, and attendance ratings continued to climb. Nap Lajoie was a player who was signed by the American League from the National League. He was paid $3,600 over the NL maximum when he signed with the Philadelphia Athletics. The 1901 season was the first season that the American League (AL) was classified as a "major league". The AL comprised the Chicago White Stockings, Boston Americans, Detroit Tigers, Philadelphia Athletics, Baltimore Orioles, Washington Senators, Cleveland Blues, and Milwaukee Brewers. The AL lured many stars of the time due to the fact that they didn't have a maximum salary, unlike the National League. Notably, Nap Lajoie was signed by Connie Mack to a $6,000 contract ($3,600 over the National League's maximum salary), $171 thousand in today's standards. Over the early years of the American League, they drew far more attendance to their games than the National League. The Orioles fell into debt, with star player Joe Kelley reporting that the team owed as much as $12,000 ($328,754 in current dollar terms). Unable to afford that debt, part-owner John Mahon began to purchase shares of the team in July 1902 from Kelley, his son-in-law, and player-manager John McGraw, who had resigned from the team and signed with the New York Giants of the NL. With this, Mahon became the majority shareholder. 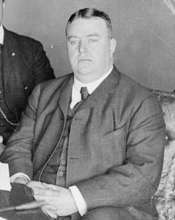 On July 17, 1902, Mahon sold his interest in the Orioles to Andrew Freedman, principal owner of the Giants, and John T. Brush, principal owner of the Cincinnati Reds, also of the NL. That day, Freedman and Brush released McGinnity, McGraw, Kelley, Roger Bresnahan, Jack Cronin, Cy Seymour, and Dan McGann from their Oriole contracts. Brush then signed Kelley and Seymour to the Reds, while Freedman signed McGinnity, Bresnahan, Cronin, and McGann, joining McGraw, his new player-manager, on the Giants. Johnson was forced to join with the Orioles' minority owners to seize control of the team using league rules and restock the team using players on loan from other AL franchises, but the Orioles had to forfeit their game that day due to not having enough players. Babe Ruth played the majority of his career in the American League. The Seattle Mariners were established in 1977 making them one of eight teams either established or moved from 1954 to 1977. 1 2 3 4 5 6 7 8 9 10 11 12 13 14 "League American". BaseballLibrary.com. The Idea Logical Company, Inc. Retrieved July 8, 2010.